NEW YORK (CNNMoney) -- Round-trip airfare from New York to Los Angeles. More than a dozen dinners for two at Applebee's. Two 16 GB iPod nanos. These are just a few of the things you could have bought if you weren't spending $368.09 a month on gasoline. That's the average amount American households spent on gas in April, according to an exclusive analysis of data by the Oil Price Information Service for CNNMoney. The study, which compared average gas prices with median incomes nationwide, also showed that U.S. households spent nearly 9% of their total income on gas last month. That's more than double what the average American family spent just two years ago, when gas prices were hovering around $2.05 a gallon. 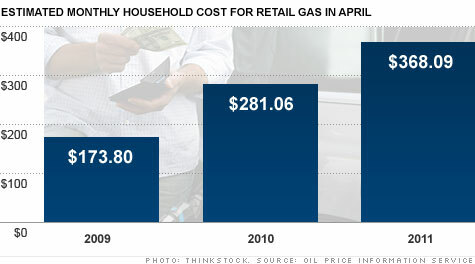 "Gas prices have just skyrocketed," said Fred Rozell, director of retail pricing at OPIS. After surging nearly 30% this year, the national average price for regular gasoline is less than 2 cents away from $4 a gallon. That's still below the all-time high of $4.114, but prices in many parts of the country have already risen to new records well above that level. For drivers in some states, the pinch of high gas prices is particularly painful. Mississippi tops the list, with the average household spening over 14% of their total income on gas last month. While gas in the state is relatively cheap, Mississippians have some of the lowest incomes in the nation, with the median household earning $36,646 a year. In addition, many drivers in Mississippi commute long distances and have older cars that lack fuel efficiency, said Rozell. At an average price of $3.64 a gallon, households in Mississippi spent $434.52 on gas in April. In New York, where a large chunk of the population lives in urban areas with mass transit, households spent only 5.5% of their income on gas. That's despite an average gas price of $3.99 a gallon in April. The only other region where drivers spend less income on gas is Washington D.C., where the average household spent just $89 on gas in April, or about 2% of total income.